The Oakmont Golf Club, facing financial challenges, will roll out a new low-cost membership in January, one designed to allow non-golfers to make greater use of and support the club. It is one of several steps to address what the OGC Board says is a cash flow problem. In announcing what it’s calling a Valley Resident Program, the OGC acknowledged that “conditions are tight if not extremely tight” after smoke from wildfires “brought an early start to winter,” a normally slow season. “The club is optimistic about its marketing and business development plans for when spring weather returns, but first it has to get there,” the board said in an emailed statement. No announcement has been made of the cost for the new non-voting memberships, which will provide discounts at the club. The thought that the club could fail, leaving a weedy swath through Oakmont, has spurred talks between OGC and the OVA, and comment on social media – with some people saying they would be willing to pay individually into a program to support the club. The club also has closed its pro shop on the East course and asked members to pre-pay their 2019 dues. The OGC has applied for a Small Business Administration loan to help meet expenses. Affecting a decision on possible support from OVA is that four OVA board seats are at stake in elections this spring. Golf’s future in Oakmont is likely to be a critical issue. 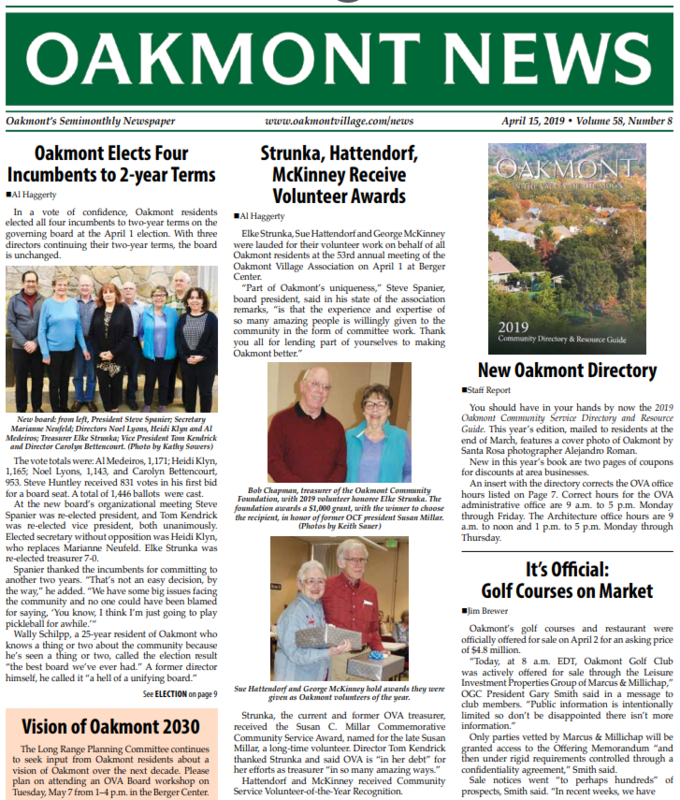 The Oakmont Village Association and OGC have been in talks for more than a year. OGC suggested, and OVA rejected, $5 monthly charge to be added to OVA dues to support the golf club. OVA Vice President Tom Kendrick, who has led talks with the club, said that the OVA is not considering any direct subsidy to the OGC and will insist that any golf aid will be contingent on receiving comparable value in return. “The OGC board has provided some recent responses that OVA now will have a chance to consider,” Kendrick said. Areas still under discussion listed by Kendrick include possible purchase of an OGC-owned lot that could provide a new access to Trione- Annadel State Park and a small storage lot on Oak Leaf Drive across from the north PG&E tower. The OVA Board on Dec. 18 appointed an ad hoc committee to coordinate discussions and proposals for board consideration. The committee includes directors and representatives of the Oakmont Community Development Committee (OCDC) and Long Range Planning Committee (LRPC). Members are Kendrick and Carolyn Bettencourt from the board, Treasurer Elke Strunka, Hugh Helm and Dave Johnson of the OCDC, and Jan Young and George McKinney from the LRPC. The OVA has set aside in its 2019 budget a $100,000 contingency for possible help with drainage at the golf club. While that is still on the table, it’s not clear that such assistance is necessary to protect Oakmont homes from flooding. In addition, that contribution is far short of the $250,000 to $300,000 in help the OGC has said it needs. The OGC statement suggested that OVA might able to provide some vendor services needed by the club. OGC General Manager Greg Anderson noted in an email announcing closure of the small East course pro shop that it had been done in the past to minimize expenses during the winter months. The parking lot there was to be chained off, but Oakmont billiards players still have access to the building from 9 a.m. to 4 p.m. The club opened the space to billiards players during closure of the East Rec Center for remodeling. OGC asked its annual members to pre-pay their 2019 dues “as soon as possible.” Members who pay monthly were asked to pre-pay some or all of their expected annual bill. The club said there are about 140 annual members and over 200 who pay monthly. OGC also invited voluntary financial contributions, which it said would be used for current expenses and not capital improvements. Golf here suffered last year during the area’s 2017 wildfires, when Oakmont was evacuated. The OGC cited recent improvements. The Quail Inn kitchen has been rebuilt and is described as operating at a very high level, with good reviews from banquet customers. Improving restaurant service is still a goal, the club board said. A recently begun series of winemaker dinners has been successful and will be expanded in 2019, OGC said.